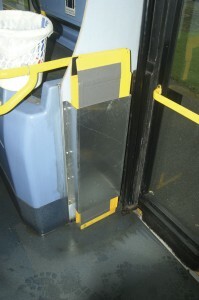 The storage compartment for the ramp on one of BorderBus’s Volvo Plaxton Presidents. BorderBus may well be a relatively new name in the industry, having only been set up in 2013, however its founder and MD, Andrew Pursey, is a name many might be familiar with. Andrew was the last family member to have run Anglianbus, the Beccles, Suffolk based operator that was sold to the Go-Ahead Group in 2012. One of the latest developments at his new operation is the introduction of the new Trio wheelchair ramp supplied by Portaramp. Chris Peat visited the BorderBus operation and Portaramp’s HQ, both based in the Norfolk/Suffolk area, to see the new portable ramp in action and in production. 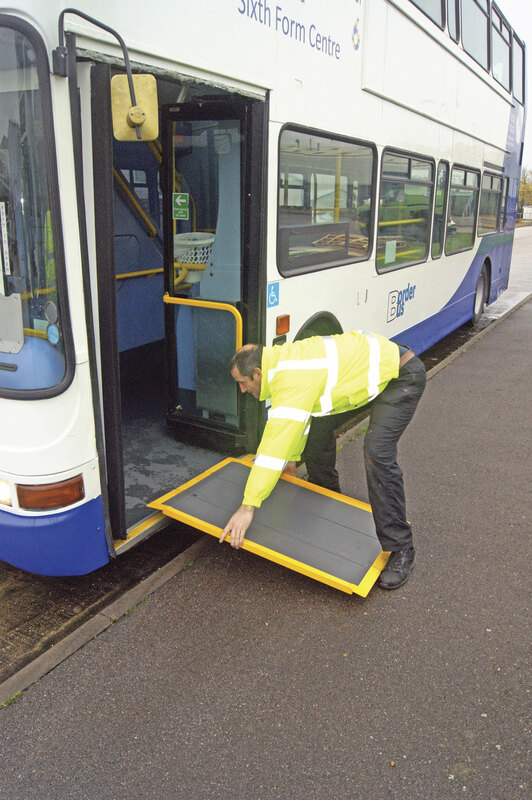 Andrew’s need for a ramp arose from the pending PSVAR legislation requiring double deckers used on registered bus services to be compliant by January 2017. 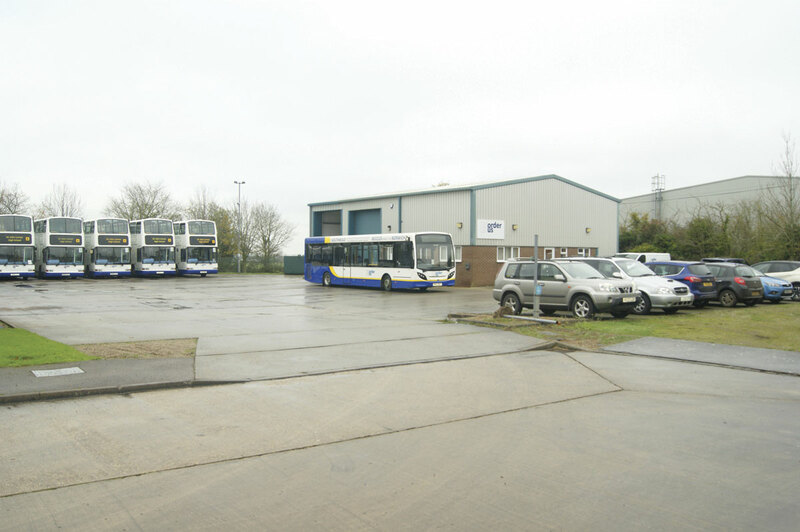 Originally, three ex-London Volvo Plaxton Presidents were supplied by Ensignbus for the service to Sir John Leman High School in Beccles, and converted to single door and 80 seats, the number of double deckers has now increased to seven. To meet DDA regulations with these vehicles, he downloaded the DDA specifications and found a lot of it was very easy to comply with, commenting that he is ‘nearly there’ with making them fully compliant. However, there was a stumbling block in the form of a wheelchair ramp. Cantilever ramps were the industry norm, he observed. These were a considerable expense though, especially for something he believed would rarely be used. On pondering this problem Andrew noticed trains often use portable ramps for wheelchair boarding at stations. Looking into this option for buses he found his way to the Portaramp website where he saw the Trio ramp, which he said ‘looked like what I needed’. 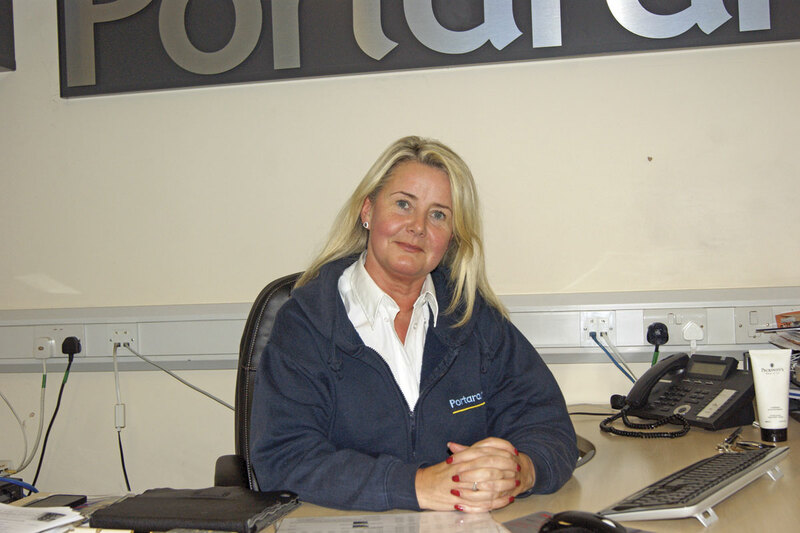 Not realising Portaramp was only down the road from him in Thetford, Andrew phoned Mandy Lancaster at the ramp specialist. After talking, he found the company could make a Trio ramp to his specifications, making it suitable for buses. ‘This was substantially cheaper than retrofitting a cantilever ramp,’ he said. It also required far less work than a cantilever ramp, as no conversion was required for it to be installed on the bus. Mandy raised the point that it also means the bus does not have to go out of service at all. What’s more, Ensignbus fitted a compartment for it to be kept just to the side of the door. This means it can be tidily stored away and, thankfully for the drivers, does not have to take up room in the driver’s compartment. The ramp folds three ways (hence the name Trio) when not in use, making it compact and easier to store. It has a safe working load of 300kg. Not attached means it can also be swapped over to another vehicle if needed. 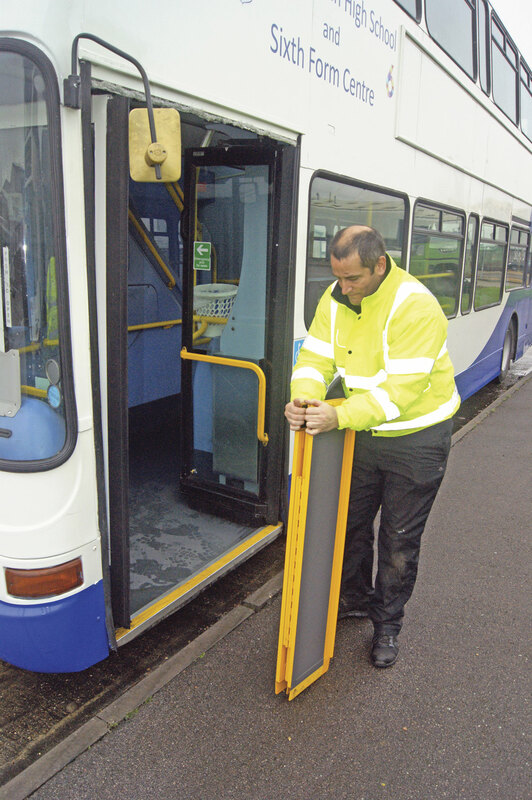 Mandy said it could also be used off the bus too, assisting mobility impaired people with negotiating steps and kerbs once they are at their destination. 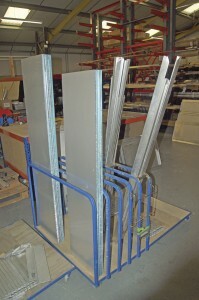 resistant surface, which is not simply stuck on, it requires a specialised process within the manufacturer’s paintshop. Mandy said she has in the past had requests just for the non-slip surface material, but she is unable to supply it. ‘It’s not a product we can send out to people, it’s a painting process,’ she said. …and puts it in place ready, all within less than a minute. After talking to Andrew, we went outside and drove one of the deckers out to a nearby kerb. 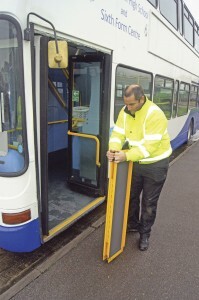 One of his drivers demonstrated setting up the Trio ramp, which took seconds to deploy. The driver who accompanied us agreed with Andrew that it is easy and straightforward to use. Andrew admits that it perhaps would not be the best solution for traditional bus services, but for school services he described it as ideal, being easy to use. Would Andrew buy more Portaramp Trios? The answer is yes, he will for the remainder of the school bus fleet. Although new to the bus and coach market, Portaramp’s Trio is not a brand new product, being available for some time already. 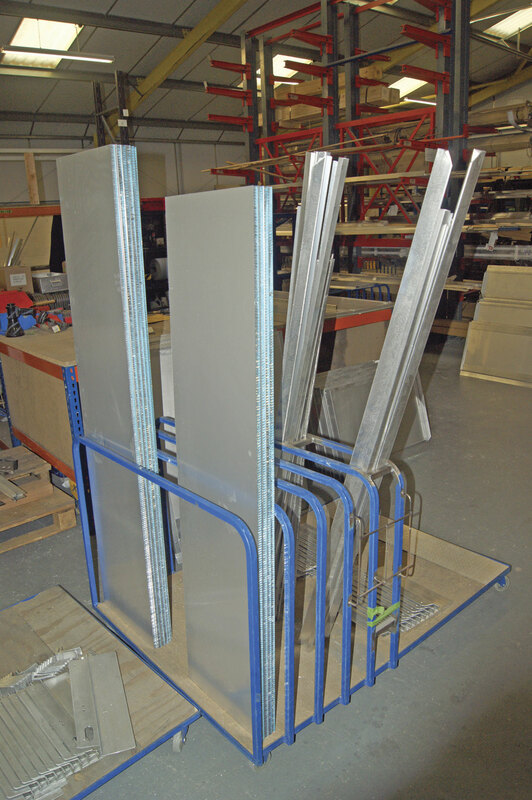 The company manufactures a wide range of ramps from its site in Shadwell, near Thetford. It produces approximately 250 to 300 per month, building to order but keeping around 20 to 25 in stock. Its ramps are sold into various sectors, including the rail and automotive markets and the domestic realm for disabled access to buildings and loading wheelchairs onto vehicles. It has designs and sizes for numerous applications, but if it does not have one to suit a specific purpose, then it can modify an existing model to specification, as it had done with BorderBus’s Trio. Even though this is the first time he has fitted this ramp, Andrew is no stranger to being a pioneer in equipment in the industry. During his time with Anglianbus he was the first to put in service an MAN EcoCity gas powered bus, showing a willingness to explore possible future fuelling trends. He said passengers appreciated this, they understood the reasoning for doing it and liked riding on a bus with extremely low emissions. On a recent trip to Porto, he noticed many of the buses over there are gas powered. On asking him why he thinks the UK has not got as many gas or alternative powered buses, he says it is ‘the unknown’ aspect of it that keeps British operators away from running more of them. However, he believes there is no need to be so hesitant in taking it up. The technicians abroad, he says, run them as if it is their ‘second nature’. Construction of a ramp underway at Portaramp’s headquarters. Not only is he a pioneer in terms of alternative fuels, he was also the first operator to take Wrightbus StreetLites. 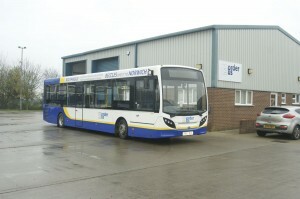 When the Pursey family sold Anglianbus to Go-Ahead, he stayed with the operation, running it as MD until April 2013. After leaving, he had no intention of starting again in the industry. However, he ‘got bored’ and decided he was too young to retire. He ‘needed something to do’, so soon after leaving the bus industry he made his return with BorderBus. Beginning with a very small fleet, it soon ‘snowballed’ into the operation it is today. The company moved into the Beccles site currently inhabited, extending the entrance to the workshop to ensure double deckers can get in and installing a Premier Pit for vehicle inspections. Sheets of the honeycombed aluminium used in Portaramp’s products. 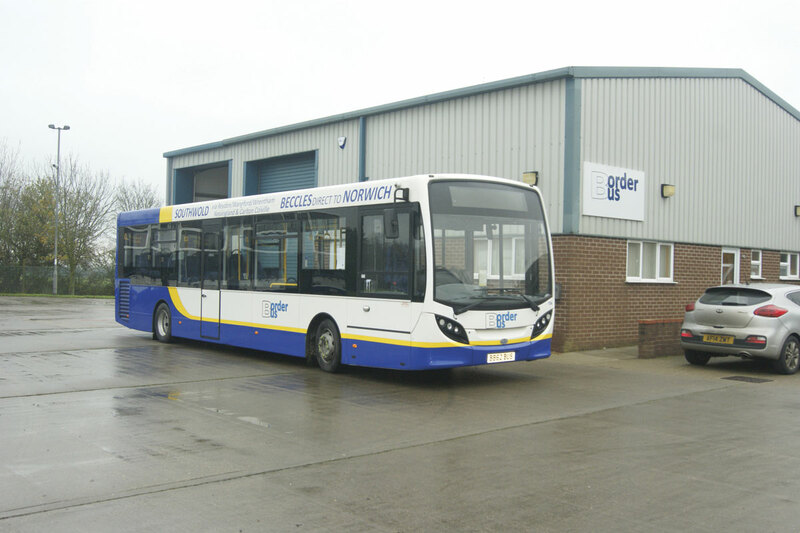 Andrew now runs a fleet of 15 vehicles, which includes the seven Volvo Plaxton double deckers previously mentioned, an ADL Enviro300 and seven ADL Enviro200s. He originally bought one new Enviro200 in April 2014 and ‘didn’t know what to expect’. After running it for a while he is very impressed with the reliability and fuel economy, ‘without fail’ it achieved 13 to 14mpg. The Plaxton double deckers are only ever used on school services, whilst some of the single deckers are used on both service types. The age range of the fleet is around the six year mark, with the oldest registered in 2000 and the youngest in 2014. BorderBus currently provides one Council tendered route, between Halesworth and Aldeburgh in Suffolk, which it won in April 2014. Although Andrew maintains good contacts at both Suffolk and Norfolk councils, he claimed he is not reliant on working for them. 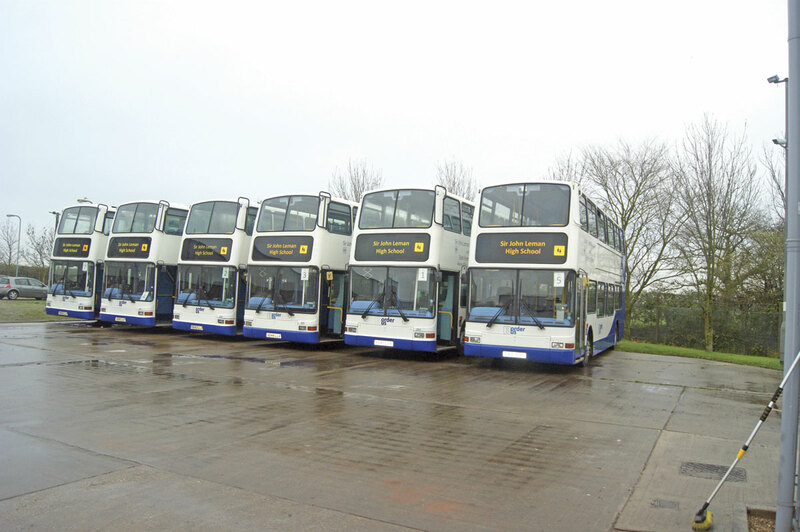 During his time at Anglian, he did a lot of work with them, but he observes nowadays the lack of funding for bus services available to local authorities. He sees the retention of BSOG at current levels in the Government’s Autumn Statement as a positive sign. The other service it runs is a commercial route between Southwold and Norwich, which Andrew said is targeted at the OAP market. He said it fits well between the school runs. Competition on half of this route comes from First, whilst his old company, Anglianbus, competes at the other end. His aim is to provide a faster service on the route, ten minutes quicker than his commercial rivals. He also believes he has an advantage over them in that his buses have a drop off in Norwich city centre, unlike the competition. This all must be paying off because he says growth on the route has been ‘tremendous’. Andrew has operated buses in the Norfolk/Suffolk region for ‘30 odd years’, so knows the area well and is confident he knows what the populace wants. He noted a few challenges, including the roads. Being such a rural area, dual carriageways are a rarity and roads can be narrow. One of the operator’s ADL Enviro200s. One of the ‘overriding factors’ behind setting up the service was reliability. He knows his services must be extremely reliable, or passengers will ‘vote with their feet’. Operating in his area is not like the big cities, where services are super frequent. Instead, they tend to be hourly and when they are hourly, those that turn up need to know the bus is going to be there. This is especially the case for his market, many of whom are elderly. They certainly do not want to be waiting in the cold for a bus that is not going to come. Something else he believes is important is putting regular drivers on routes, ensuring his employees and customers develop a relationship. Patronage growth on the 146 service has come on in ‘leaps and bounds’, Andrew said. In November 2015, passenger numbers were up 144% on the same period last year and the on bus revenue was up by an impressive 215%. 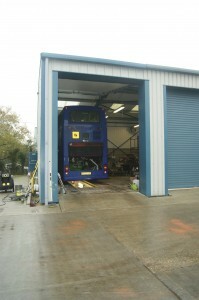 The entrance to the workshop had to be extended to allow in double deckers. A line up of BorderBus’s Plaxton Presidents. It is evident they look after them in that since he has started BorderBus he has not had to make a single insurance claim, ‘other than windscreens’. Thankfully there is relatively low crime in the majority of the area BorderBus operates in, which no doubt helps avoid criminal damage to his fleet and property. Even so, 14 of his fleet are fitted with CCTV, but he maintains that it is not high on his agenda to fit this equipment, with spurious claims a rarity in his part of the world. As well as cameras, Andrew is familiar with telematics too, having a good relationship with MiX Telematics from his time at Anglianbus. These days however he finds he actually has the time to look after the services himself. ‘I will soon see if I’ve got a driver with a heavy foot or a problem with a bus.’ He says he is very keen on monitoring the fuel economy of his operation. Using Ticketer means he has been able to roll out a smartcard scheme for his school services. Any student at the school can buy a card and top it up online. Introduced this September, it saw the operator work with Ticketer to set it up. ‘It’s worked well, generally it’s gone very smoothly,’ Andrew said.